Risa Puleo, an independent curator and critic from San Antonio, TX, served as Bemis Center's inaugural Curator-in-Residence from January–December 2017. During her residency, she curated two original exhibitions, Chimeras and Monarchs: Brown and Native Contemporary Artists in the Path of the Butterfly. 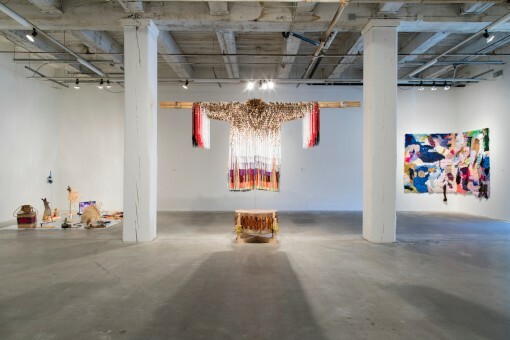 She also presented public programs and served as a professional resource for artists participating in the Bemis Center's residency program as well as the Greater Omaha arts community. Chimeras, on view at Bemis Center for Contemporary Arts February 2–April 29, 2017. Photo: Colin Conces. Monarchs: Brown and Native Contemporary Artists in the Path of the Butterfly, on view at Bemis Center for Contemporary Arts December 7, 2017–February 24, 2018. Photo: Colin Conces. Puleo attended Bard College's Curatorial Studies Program and has a Masters in Art History from Hunter College. She is former Assistant Curator of American and Contemporary Art at the Blanton Museum of Art at the University of Texas at Austin. Puleo's writing has been published in Bomb, Art in America, Art Asia Pacific, Modern Painters, and Art Papers, among other publications. The Curator-in-Residence program's inaugural year is made possible by Carol Gendler and the Mammel Foundation. Additional support is provided by the National Endowment for the Arts and The Andy Warhol Foundation for the Visual Arts. Puleo was selected from an international pool of 88 applicants. All applications were reviewed by a four-person panel including Karin Campbell, Phil Willson Curator of Contemporary Art, Joslyn Museum, Omaha, NE; Charley Friedman, Artist and Co-Founder, Fiendish Plots, Lincoln, NE; Ellina Kevorkian, Artistic Director, Residency Programs, Bemis Center for Contemporary Arts, Omaha, NE; Alex Priest, Exhibitions Manager, Bemis Center for Contemporary Arts, Omaha, NE.